Grandmaster Carl Stone began his training in 1960 while stationed with the 173rd Airbourne Brigade (paratroopers) in Okinawa. He studied Isshinryu with its’ founder Tatsua Shimabuko and Uechi Ryu with Kanei Uechi. When he returned to the U.S. in 1964 Grandmaster Stone trained with legends Pat Wyatt (Shuri Ryu), Al Gene Caualia (Kajukenbo), Jim Loncevic (Shotokan and Judo), and John Keenan AKA Count Dante. He received his 1st Black Belt in 1967 and in 1968 he moved to Florida where he studied Goju with William Liquori. Sensei Stone was Sensei Liquori’s 1st Black Belt. He also competed in the 1st full-Contact Kickboxing Match in the state of Florida with movie star Don "The Dragon" Wilson. In 1970, Carl Stone opened his 1st Karate School in West Palm Beach, Florida with Sensei Mark Herman (Shotokan and Ju-Jitsu). In 1971 Sensei Herman awarded him with his black belt in Shotokan. By 1973 they had the largest Karate School in the U.S. with over 750 students. From 1973 to 1979 Sensei Stone trained over 10 full contact fighters, 6 of those fighters were ranked top 10 in their divisions. Later 2 of those fighters continued their training and went on to become world champions (Steve Sheperd, 5 time World Champion and Gary Spoule, WAKO light-heavy weight World Champion). In 1980 Sensei Stone moved to Largo, Florida where he continued his studies. About a year later Sensei Stone opened up a little school at his home until he opened up his 1st Karate School in Pinellas County. Sensei Stone has developed his own unique style called Kyu Shin Ryu which means the school that teaches you how to govern your mind. This style was recognized by the World Head of Family Sokeship Council. 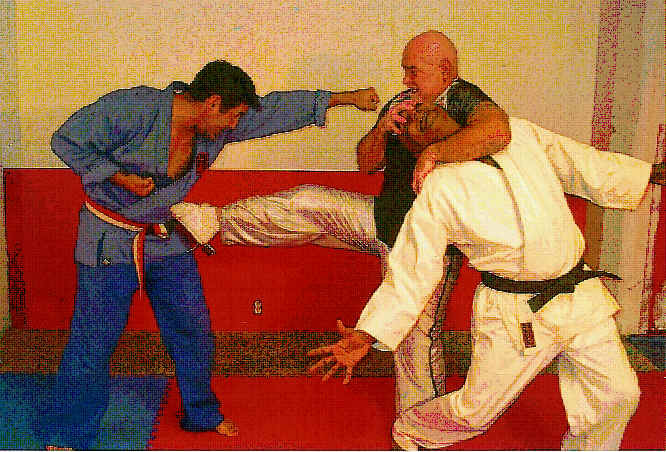 Carl Stone is a member of The World Head of Family Sokeship Council, co-founder of Florida League of Martial Arts and an active member of the Project Action Foundation, an organization to help "at risk" children. He currently holds numerous black belts in diffrent styles his highest a 10th degree Black Belt in Kyu Shin ryu and has been training in the martial arts for over 45 years. This year Granmaster Stone will be awarded the Diamond Award Of Excellence at the Cosmopolitan Florida Hall of Fame for his work in the martial arts.